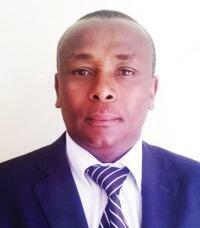 Prof. James Njiru is the Director of Kenya Marine and Fisheries Research Institute. He has a wealth of experience in Fisheries Research and Academia. He is a graduate of Moi University with a BSc in Zoology, Botany and Chemistry, MSc in Aquatic Science, Fish Biology and Ecology from the University of British Columbia, Canada. He obtained his Ph.D from Moi University in the same field. Prof. Njiru started his career as an Assistant Research Officer in KMFRI in 1989 where he rose to a Senior Research Officer before he moved to Moi University in 2005 as a lecturer. From 2012, he was an Associate Professor in the department of Fisheries and Aquatic Sciences, University of Eldoret, Chepkoilel. He moved to Kisii University in 2014 where he held various responsibilities as a Head of Department, Director of undergraduate Studies to his last assignment as the Director for Post-graduate studies. He has been a team leader in many research projects in the region. He is widely published and also has authored 35 children books with four approved by the Ministry of Education in its curriculum. He is also the current Managing Editor of the East African Journal of Water Association and a Reviewer of four peer reviewed journals. Prof. Njiru is the secretary to the Aquatic Science Association of Kenya. Njiru M and C. Ngugi (Eds) (2018) State of Cage Culture in Lake Victoria, Kenya, pp 62. LaxPress, Kenya. Njiru J. M., Aura C. M. and Okechi J.K.(2018) Cage culture in Lake Victoria: a disaster or a saviour in waiting? Fisheries Management and Ecology. 00: 1-9. Aura C., Yongo E. Okechi, Musa S. Yongo E. Okechi J. K., Njiru M. et al (2018) Integration of mapping and socio-economic status of cage culture: Towards balancing lake-use and culture fisheries in Lake Victoria, Kenya. Aquaculture research49 (1) 532-545. Aloo P.A, NjiruJ. , Balirwa and J. S. Nyamweya C (2017). Impacts of Nile Perch, Lates niloticus on the Ecology, Economy and Conservation of Lake Victoria, East Africa Lakes & Reservoirs: Research and Management 22 (4): 320-333. Njiru M.J and Aura M. C. (2017) Life in the ocean – Chapter 1: UNESCO-IOC. Stories of Africa’s Ocean and Coasts: Volume 2: Kenya’s Coastal and Resources and Environment, Mwanyuma H., Odido M., Lamin A.R., and Mackongo L-A. (Eds). IOC Information Document, 1319. Aura C. M., Kimani E., Musa S., Kundu K, Njiru (2017) Spatio-temporal macroinvertebrate multi-index of biotic integrity (MMiBI) for a coastal river basin: a case study of River Tana, Kenya. Ecohydrology & Hydrobiology17: 113–124. Njiru J., Waithaka E., Aloo P. (2017) An Overview of the Current Status of Lake Naivasha Fishery: Challenges and Management Strategies. The Open Fish Science Journal, 10, 1-12. Nyamweya, C. Sturludottir, E. Tomasson, T, Taabu-Munyaho, A., Njiru, M,. Stefansson, G. (2016) Fish and Fisheries Prediction of Lake Victoria's response to varied fishing regimes using the Atlantis ecosystem model. Environmental Modeling & Software 86 158-167. Kundu R., Muchiri M., Njiru M., Nyamweya C (2016) Effect of Social and Economic Drivers on Success of Small Scale Fish farming in Western Kenya. African Journal of Tropical Hydrobiology and Fisheries 14: 29- 44. Njiru M., Martin van Knaap, M. A. Taabu, C. Nyamweya, R. Kayanda, E. Mlaponi, B. Marshall (2014) Management of Lake Victoria fishery: Are we looking for easy solutions? Aquatic Ecosystem Health Management Journal Ecosystem Health & Management, 17:1, 70-79.